"But to what end were we created? We were created with the express purpose and potential of experiencing a fulness of joy (see 2 Nephi 2:25). Our birthright—and the purpose of our great voyage on this earth—is to seek and experience eternal happiness. One of the ways we find this is by creating things. "If you are a mother, you participate with God in His work of creation—not only by providing physical bodies for your children but also by teaching and nurturing them. If you are not a mother now, the creative talents you develop will prepare you for that day, in this life or the next. "You may think you don’t have talents, but that is a false assumption, for we all have talents and gifts, every one of us (see D&C 46:11–12). The bounds of creativity extend far beyond the limits of a canvas or a sheet of paper and do not require a brush, a pen, or the keys of a piano. 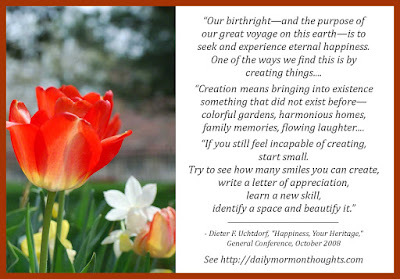 Creation means bringing into existence something that did not exist before—colorful gardens, harmonious homes, family memories, flowing laughter. "What you create doesn’t have to be perfect. So what if the eggs are greasy or the toast is burned? Don’t let fear of failure discourage you. Don’t let the voice of critics paralyze you—whether that voice comes from the outside or the inside. 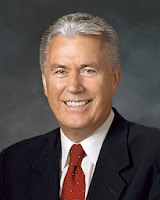 President Uchtdorf has an interesting premise in this excerpt. We were created to find joy; and we find joy through creation. Motherhood provides a unique opportunity of creation, and therefore of joy. It begins with the shared process of the creation of life, of helping to provide a physical body for one of Heavenly Father's spirit children. But it continues in the nurturing and education of that new life, in the ways only a mother can. We should all be deeply grateful for our own mothers and the part they played, in the hands of God, in our personal creation. Our creations will not be perfect. Many times they are far from it! But each effort to create joy, beauty, or goodness will bless us personally and will be an instrument in God's hands in blessing others. There are so many simple ways to participate in our Father's eternal plan of happiness!